NEW YORK (CNNMoney) -- Whenever a gas price story is published on this site, astute readers write in to say that gas is in their area is much more expensive than the nationwide average. It's true, in many cities gas is already well over $4 a gallon on Tuesday. The average U.S. price for a gallon of regular is $3.38, according to AAA. But the price in Hawaii, the most expensive state in the country, is $3.78. Meanwhile, in Montana it's a mere $3.07. Gas prices vary a lot depending on the state, city, and even the block where you buy your gas. The biggest reason is taxes. 75% to 80% of the disparity between states is due to taxes, according to Rayola Dougher, senior economic advisor for the American Petroleum Institute. First there's the federal gas tax. It's a standard 18.4 cents nationwide. Then states tack on an additional excise tax. That varies from just a few cents to over 20 cents. On top of that, some states add an additional sales tax. Then in a few unlucky locales, county and city governments levy their own sales tax as well. Some states use these taxes solely for road maintenance and construction, Dougher said, while other places put the money into their general fund. Added all up, gas taxes can range from a low of 26 cents in Alaska to a high of 66 cents in California, according to API. Aside from Alaska and New Jersey, most of the low tax states are in the South. Drivers here tend to spend the highest percentage of their income on gasoline, often thanks to long commutes and lower wages. The fact that people here are already shelling out a big chunk of their check on gas may make it more difficult for southern states to raise their gas tax. States in the Northeast and on the West Coast have the highest gas taxes. People in those regions tend to have higher incomes, access to better public transit and spend a smaller portion of their paychecks on gasoline. While taxes make up the biggest reason for the price disparity between states, they aren't the only source. Transportation, distribution costs and distance from refineries can also add to the price of gas. Even within cities gas price varies wildly. In New York City, a Citgo service station located on the Hutchinson River Pkwy, a heavily traveled thoroughfare in the Bronx, sells gas for $4.09 a gallon, according to price tracker Gasbuddy.com. Meanwhile in Staten Island, the Power Test service station sells a gallon for $3.46. Also, where the crude oil comes from plays a role in gas prices. In the Northeast a lot of oil and gasoline comes from Europe, where prices have been higher. Alaska, Hawaii and California, the three highest priced states, rely on crude oil from Alaska which is heavy and more difficult and expensive to turn into gasoline. This is why Alaska's gasoline, despite having the lowest taxes, is one of the most expensive in the nation. Plus, most of the gas in the West Coast must be formulated to meet California's strict emissions standards, further driving up the price. States in the rocky mountains, on the other hand, are enjoying the benefits of a recent boom in domestic energy production. Formerly inaccessible oil from shale rock formations in Colorado and North Dakota doesn't have to travel far to reach local refineries, said Stan Dempsey, head of the Colorado Petroleum Association. Plus, natural gas liquids, a byproduct from the area's burgeoning number of natural gas wells, can also be turned in gasoline. Both of these domestic energy products are far cheaper than oil bought in other markets, especially overseas. "We're just in good shape in terms of supply," said Dempsey. 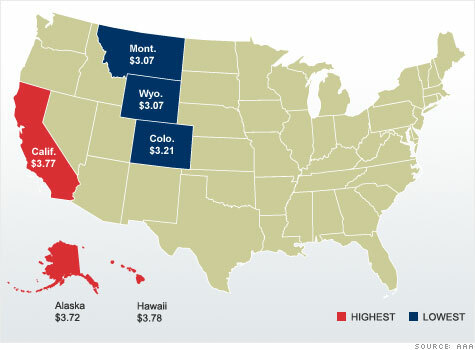 The result is that Wyoming, Colorado and Montana now have the cheapest gas in the nation, despite a tax rate that is about average. Who gets rich off of $100 oil?